MyDigitalSDSD is the first company to release firmware version 12.1 for drives powered by the Phison E12 controller. We’ve been waiting months for this firmware to be released as it promised to deliver massive performance gains. 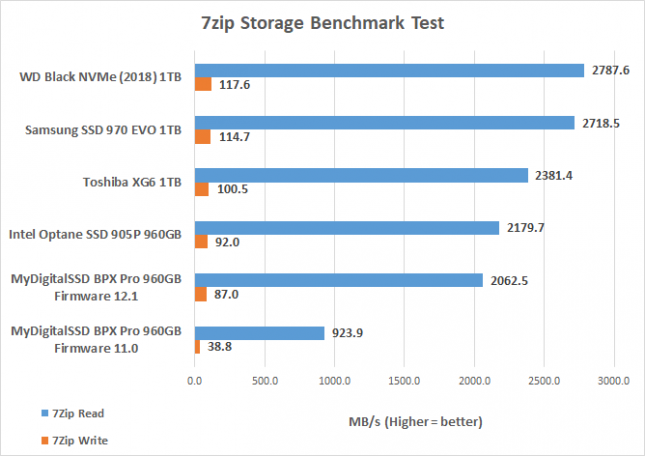 After testing the MyDigitalSSD BPX Pro 960GB drive with this new firmware build versus the original firmware version 11.0 that it shipped with, we can say that it was worth the wait. The only bad news is that the firmware update is destructive and has to be done in windows with the BPX Pro as a secondary drive. The firmware update for MyDigitalSSD BPX Pro series is done with Phison’s Reinitial Tool, which is looks like something you’d never want to put into a customers hand. The application should find the Phison E12 controlled drive in your system and then ‘reinitial’ the drive with the new firmware. All that you need to do is ensure that the right drive is selected and hit run. All the blocks on the drive will be erased and the new firmware will be installed. We actually gave some feedback to MyDigitalSSD/Phison about the name of this tool and some of the wording and they are looking at updating it before releasing it to the masses. (Sorry, we delayed the public release of this firmware update). We did some quick before and after benchmarks on our Windows 10 Pro v1809 powered test system to see just how big of a difference could be seen. 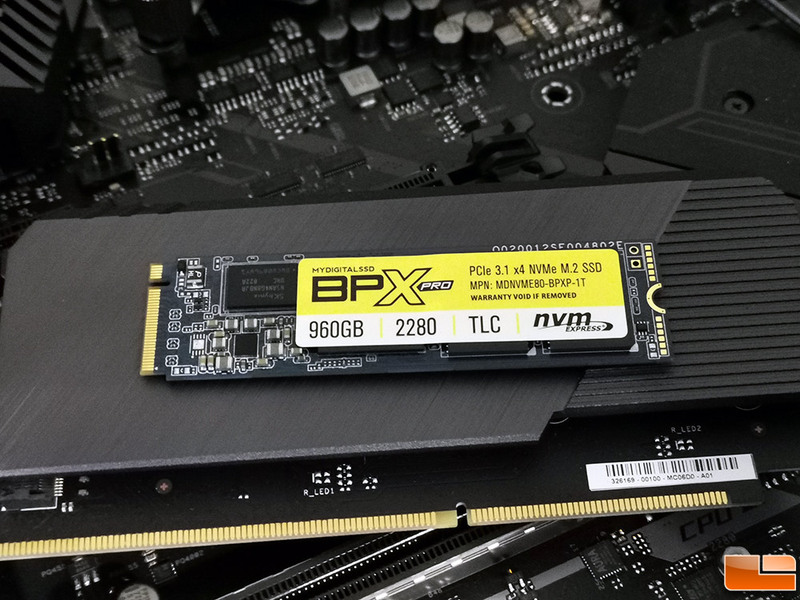 To test out performance of the BPX Pro 960GB drive we installed it on the ASUS ROG Maximus XI Extreme Intel Z390 motherboard (UEFI 0602 from 10/31/2018) with an Intel Core i9-9900K processor and 16GB of DDR4 3200MHz memory. It should be noted that all testing was done with the MyDigitalSSD BPX Pro 960GB drive as the primary drive in the system, so it contained the Windows 10 installation. Anvil’s Storage Utilities 1.1.0 showed that our Intel Core i9-9900K processor scored 14,160.33 points with the original 11.0 firmware and then that score jumped up to 17,082.82 points with the 12.1 firmware. This is almost a 21% improvement in performance from just the firmware update! Both read and write performance was improved. Random 4K QD16 write performance went from 452,000 IOPS to almost 579,000 IOPS! The more important Random 4K QD1 write performance went from 35,900 IOPS to 41,700 IOPS, a gain of over 16 percent. Next up we looked at CrystalDiskMark and again saw nice performance improvements in almost ever workload tested. 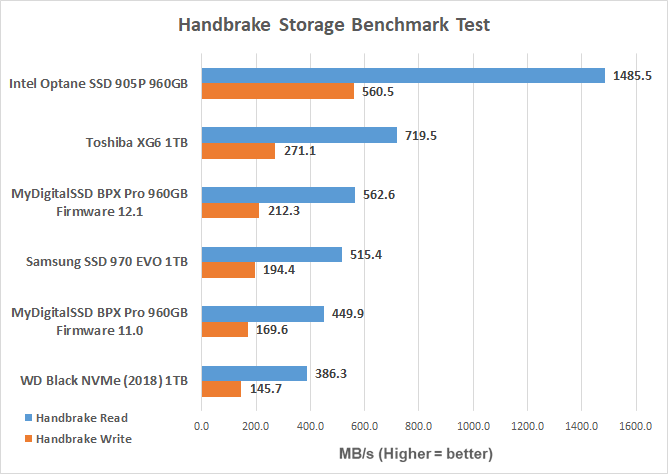 In our real world application testing we found the MyDigitalSSD BPX Pro 960GB drive performance improved with the new firmware. 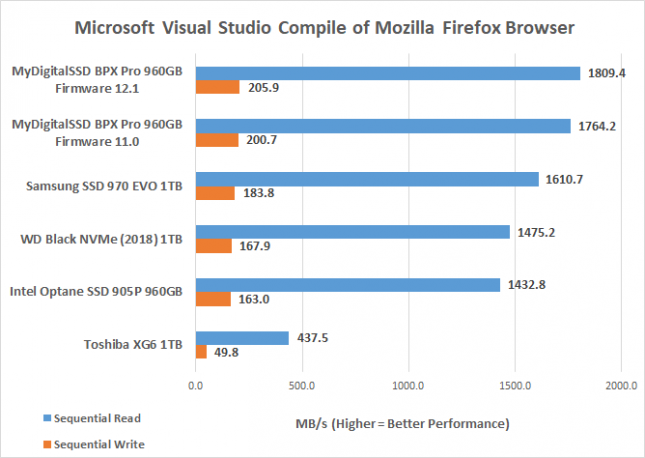 On a workload that uses Microsoft Visual Studio to compile a build of Mozilla Firefox browser we saw modest gains of almost 3% on the sequential read test. The improvement in a Handbrake transcode test showed even more performance improvements as we noted gains of 25% on reads and writes. 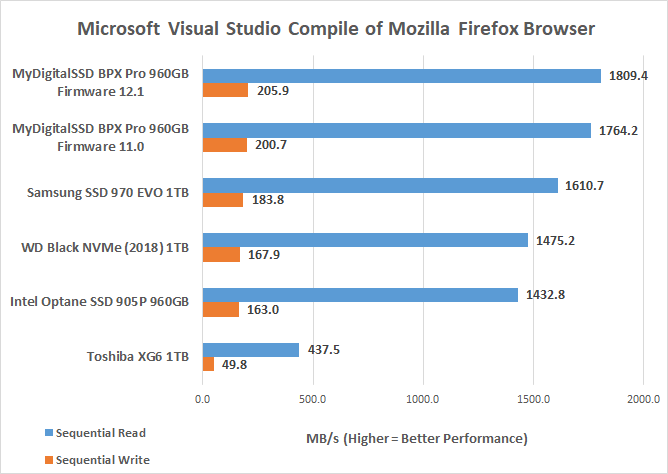 The largest gains came in 7zip though as we more than doubled our read and write performance and the MyDigitalSSD BPX Pro is now competitive with other NVMe 1TB drives. Not every benchmark and test that we ran showed performance gains on the MyDigitalSSD BPX Pro running the new firmware v12.1. 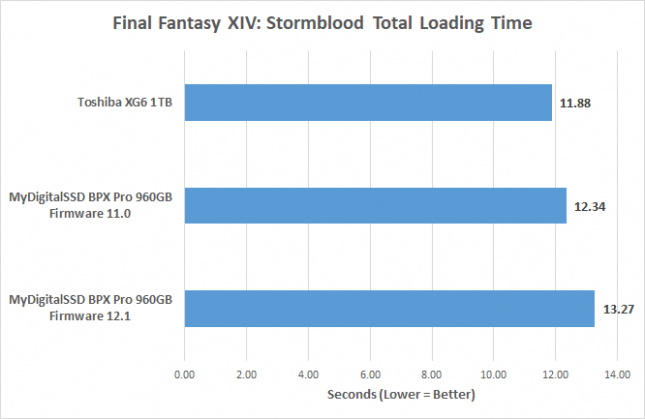 We noticed a performance decrease on game load times in the Final Fantasy XIV: Stormblood benchmark utility. The performance drop was less than a second or about 7 percent. This isn’t a horrible drop, but we are gamers and hate to see the only major performance drop to be on game load times. The new Phison E12 firmware looks offer a nice performance bump in most areas that we have looked at so far. We have been holding our MyDigitalSSD BPX Pro review since this firmware was supposed to bring massive performance gains and it looks like we made the right call that. It’s disappointing to see a destructive firmware being released for an SSD in 2018, but a decade ago pretty much every firmware update for SSDs were destructive. The new firmware improves the overall performance on the MyDigitalSSD BPX Pro series and that should help sales despite the fact that it is already an affordably priced NVMe series. MyDigitalSSD will be posting guides on how to do this update on their site and will be hosting the firmware update utility. We’ll be sure to update this article with those links when they become available. 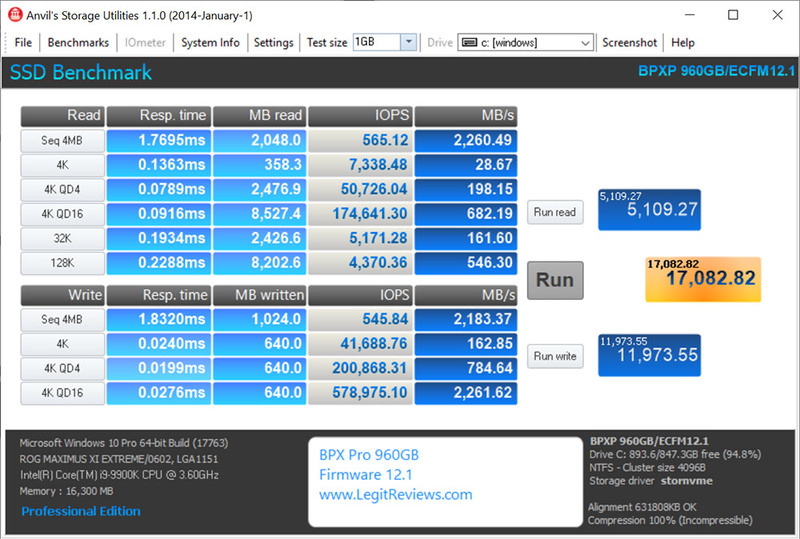 We’ll also be starting on the full review of the MyDigitalSSD BPX Pro series and plan on having that posted in December.